Prince Harry and Meghan, Duchess of Sussex, are a 21st century couple -- it's their time. They know they have the opportunity to change perceptions about race and identity in Great Britain, the United States and around the world. Michelle Miller shows how this couple breaks the barrier of who can be a royal. "Ladies, may we lift up our sparkling cider …to the happy couple!" 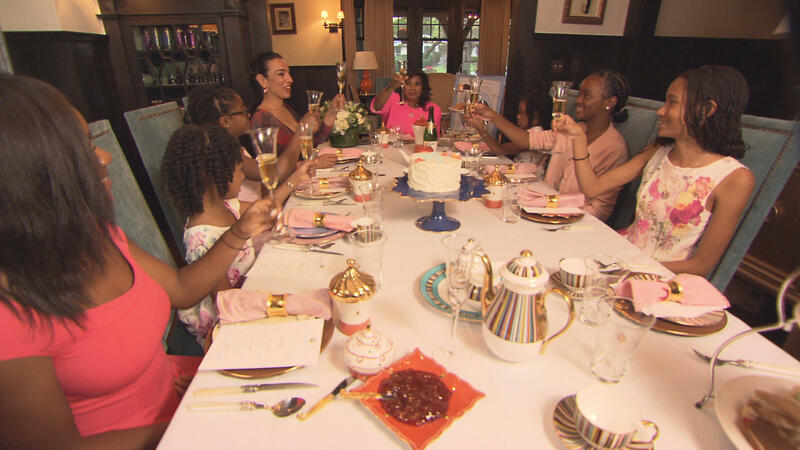 It's a British high tea in South Orange, New Jersey, where Carolyn "Cookie" Mason is hosting daughter Chloe and her friends. "There is no better way to celebrate a wedding than to have tea with friends," Cookie tells CBS News correspondent Michelle Miller. Even though Meghan's official title is duchess, to this group, she is a princess – their princess. "Now we see that a real-life black princess can actually be in the British royal family. So it shows young black girls … that like this can actually be a reality, not just a fantasy, like in story books," says 16-year-old Tyler Newman. "Why did she pick Harry?" Miller asks the partygoers. "I heard it was a set up. A blind date," Chloe Mason, 15, replies. "Can you imagine going on a blind date with a prince?" The couple may be breaking with tradition, but not Cookie. "You have to pronounce it sconz like the British. Not scones like the American's do," she instructs the young ladies seated at the table. And the dessert is a cake congratulating Meghan. "I noticed Meghan got all the congratulations," Miller notes. "You know, we debated that. I really struggled, because I didn't want to make it about just her. But from our perspective, right … as young women, it really is about her," Cookie replies. "I think for me, because I actually grew up in London," says Natalie Pemberton, 16. "And I was following, you know, Prince Harry's journey to find love, you know [laughs] … I was always like, curious like who's he going to find, you know. And when I saw it was her, I was like, 'Whoa.'" "OK, girls. Who was your favorite princess coming up? And why?" Miller asks. "Well, I think I like Mulan because she wasn't just like one of those girls that sat down and wore, like, prissy, pink dresses," 11-year-old Jada Watson says as she shrugs her shoulders, rolls her eyes and points to herself. The group howls with laughter. "Even though you're wearing a pretty, prissy, pink dress," Miller points out. "Yeah," says Jada. While Mulan may be Jada's favorite fictional princess, the most relatable was Tiana, Disney's first African-American princess from the 2009 movie, "The Princess and the Frog." "And I remember feeling … like a bit proud to be who I was then," Jada says. "I looked like her and I dressed like her for Halloween. And I felt so good. I was just like, "Yeah, I look exactly like her so I'm so cool [laughs]." "So Meghan Markle is a princess of color," notes Miller. "And what does that say to you ladies about what you can be?" Miller asks. "It doesn't matter your race, your ethnicity, what you look like," Jada says. "You can do whatever you want." "She doesn't look like many of you. Does that matter?" The girls all shake their heads, "No." "I feel like it doesn't matter because it's her identity. And the fact that she does identify as biracial and she doesn't try and hide it or anything, she's very proud of it," says Natalie. "What matters to you about who she is?" Miller asks the younger attendees. "Um. That she's honest," says Preeya Watson, 6. "How about you, Sophia?" Miller asks Sophia Watson. "That she seems really nice," the 6-year-old says. "I think that Meghan Markle says to young women in this country that you are unprecedented … that you must be your authentic self and thrive in that," says Mikki Taylor, editor-at-large of Essence Magazine. Taylor enjoys watching Meghan embrace her African-American lineage. "She's very clear about the magnificent truth of who she is," she says. Meghan has written about her pride in her family -- from her mother all the way back to her great, great, great grandfather, a freed slave. "She's proud to have her mother standing by her side with her locks in her hair, right? Similarly, Harry doting after his wife, bringing her mom and her family along. He's very proud of that too," says Cookie. "What's different about Meghan Markle is not just her heritage. It's the fact that she owns her heritage. That she speaks openly about it," says Afua Hirsch, journalist and author of "Brit(ish)"
"My name is Meghan Markle … You know, a couple years ago I heard someone call my mom the N word …"
Meghan, who grew up in a racially charged Los Angeles, watching the riots after the Rodney King verdict, has seen racism up close. Her message to the world is inclusion. Meghan Markle PSA: Having a mixed world is what it's all about … Certainly, it makes it more beautiful and a lot more interesting. It's a message Hirsch says is particularly important in Britain, a country that -- according to its most recent census -- is 87 percent white. "It sends a message that if you do have heritage that is not white, it's not something you have to ignore or pretend not to notice. And pretend it's not important. You can talk about it. You can be vocal about your experiences," she says. "What do you see her doing for women of color?" Miller asks. "Just being like a face for women of color," says Tyler. "Just seeing how she dresses herself, how she conducts herself and puts herself out in the world. She's not just representing herself, but she's representing all of black women and what we have to bring." "Do you think that it's a big responsibility that she has to bear as a woman of color?" Miller asks. "I think it is. But I feel like that's something that all of us have to bear every day. Being women of color. And it's not just her. It's something that is universally felt throughout the black community," Tyler explains. "Will Meghan Markle change the monarchy?" Miller asks Mikki Taylor. "I think Meghan Markle has already changed the monarchy," she replies. "I think they're creating a new script. Not only for the monarchy, but for the world to see. And its time." "I do see myself in her. …And I look up to her," says Chloe. "I do see hope for the future. And so I hope that one day I can … do something that will allow people to have hope in me and to believe in what I can do. "